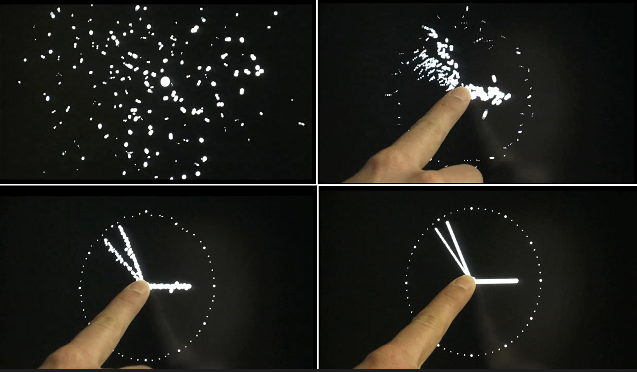 A screen displays a cloud of points that move randomly, but when it is touched the points gather to form a clock, until it is released and the points resume once again their random paths. Artist Eric Morzier says that the ephemeral formation of the clock reminds us that time continues inexorably. The fascination with time has inspired countless interfaces, none more radical than the recent smartwatch. At the heart of a region renowned for fine traditional watchmaking, an exhibition reveals how the division of time by mankind more than 5,000 years ago continues to foster ingeniousness and creativity. Telling Time at Lausanne’s Mudac design museum focuses on the capture of time by watchmakers, designers and artists from the 16th century to today, including the brazen newcomer, the Apple Watch. For 30 years, Fabienne Xavière Sturm was in charge of the famous collections of the Museum of Watchmaking and Enamelware in Geneva, which she presented all over the world, but when she was invited by Mudac’s director, Chantal Prod’Hom, to co-curate the Lausanne exhibition, they rapidly decided to concentrate not on watchmaking or time itself, but on the way timepieces tell time. With more than 150 examples in diverse styles from different ages, including from the great watchmakers of history – Vacheron Constantin, Cartier, Piaget, Audemars Piguet, Jaeger-Lcoultre, and IWC – the exhibition is a tribute to man’s poetic hold on time. The division of time into hours probably dates back to 3,500 BC explains the show’s historical advisor Arnaud Tellier, former director of the Patek Philippe Museum in Geneva. It has been attributed to a semi-nomadic tribe, the Chaldeans, who settled in southern Babylonia, currently Iraq, and whose astrological observations led to the numerical division of time. The Chaldeans noted that it takes 360 days for the same pattern of stars to appear in the sky and began by dividing the year into six periods of 60 days. The so-called sexagesimal system is believed to have been chosen because 60 is the smallest common multiple of 1, 2, 3, 4, 5 and 6, therefore divisible by all six numbers.The later division of the hour into 60 minutes (from the Latin for small) and 360 seconds (for ‘second minute’, following the second division of the hour) repeated the same pattern and is also said to be at the origin of the 360 degrees of the circle. The Chaldeans further divided the day into six time intervals, three for day and three for night. Consequently the length of the intervals was variable, depending on the time of year and location. Using a sundial, the Egyptians then divided the day into 12 intervals, probably to reflect the number of lunar cycles in a year and then subsequently into two periods of 12 intervals, the second one for night. It was only with the invention of mechanical timepieces in the 13th and 14th century that the length of hours could at last be anchored into a fixed time. According to Tellier, the first clocks were created to regulate the cycle of prayers in the monasteries after dark. 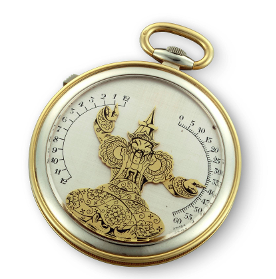 With the invention of the pendulum around 1660 and the spiral balance in 1675 by the Dutch mathematician, astronomer and physician, Christiaan Huygens – who was inspired by the works of Galileo – clocks and portable timepieces could at last tell the minutes and not just the hours. Wandering hours, day and night dials, ‘grandes complications’ with the phases of the moon, lavishly enamelled dials with portraits of royalty, circles, squares and triangles, the telling of time has been nurtured by infinite imagination. Sturm points out however that this has not always been the case. Timepieces were originally made by clock and watchmakers alone. Then merchants stepped in and entrusted the many stages of the production to different craft masters, including engravers, relief carvers, jewellers and enamellers. Geneva played an important role in establishing Switzerland as a pivotal player in the field. The harsh climate of the neighbouring Jura allowed the manufacturing to take place during the winters when the farmers had nothing to do. It is no surprise, according to the co-curator, that designers and artists later came to use time as a springboard to their own imagination and their proposals make up a large part of the show. 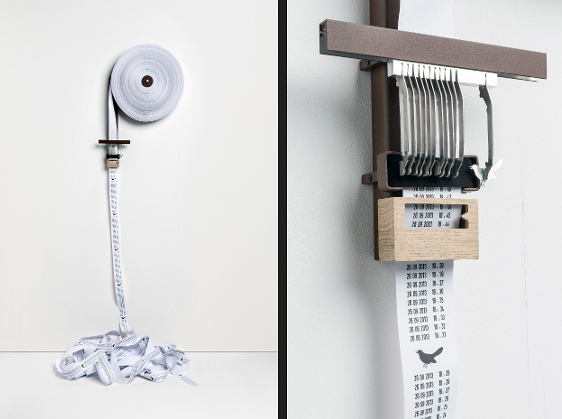 Using flip dials, videos, lashes, knitting machines, paper cut-outs, or beads, world-famous contemporary artists such as Darren Almond, John Armleder and Gianni Motti join young designers to invent quirky, ingenious, bizarre and amusing new ways to capture time. 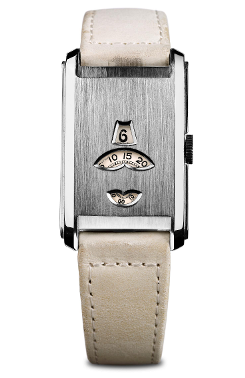 The decision to end the selection with the connected watch conveniently opens the door to the future. ECAL, the internationally renowned University of art and design Lausanne, has ensured the scenography of the show, but very few of its students, director Alexis Georgacopoulos points out, even wear a watch. He thinks however that vintage models, particularly those bold designs from the 60s and 70s, are making a comeback. As for the Apple Watch, Georgacopoulos suggests that its success will also depend on whether it is renewed as frequently as the phone. He adds somewhat provocatively that it should jolt the top-end watch industry into action. One brand has already responded. Jean-Claude Biver, CEO of Tag Heuer, has announced the launch of a Swiss smartwatch by this autumn. He hopes that Apple will sell “millions and millions” so that young people will start wearing watches again, but will turn to different brands when they tire of owning the same as everyone else. The Zurich-based Smartwatch Group predicts that 27 million smartwatches will be sold this year, with sales climbing to 650 million by 2020. By combining heritage collections with playful contemporary designs, Telling time has provoked a dialogue between history and the present that teases our perception of time. “This is not just about objects. Philosophy is never very far away,” says Xavière Sturm. 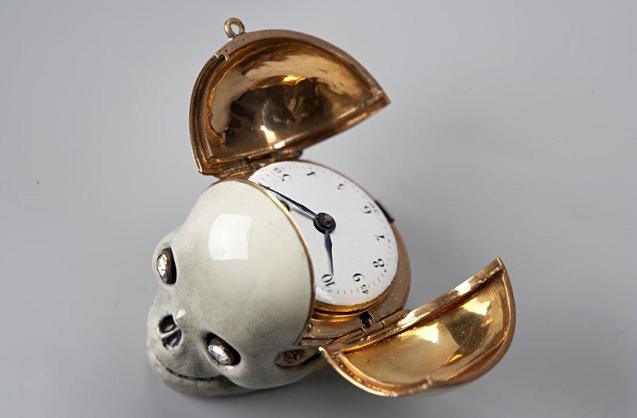 Memento mori, which in Latin means ‘Remember you must die’ has been a favourite among watchmakers who use the skull to show our impermanence. The Lausanne exhibition also includes more recent examples by the contemporary Swiss artist John Armleder and designer Fiona Krüger. Example of a ‘jump watch’ – because the time segments ‘jump’ in packs of combined lengths. This 1935 Art Nouveau wrist watch has three windows, one for hours, one for minutes that jump every five minutes and a third one for seconds that jump every ten seconds. 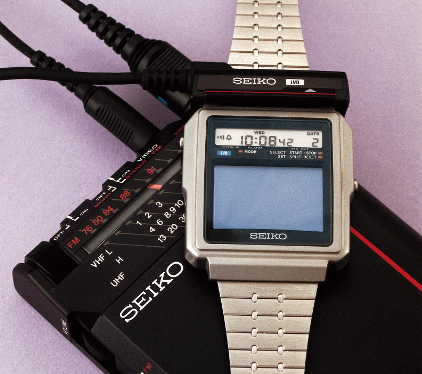 The Japanese manufacturer did not wait for the digital age to experiment with a watch that could receive radio and television, as well as tell the time. the right arm for the hour and the left arm for the minutes. 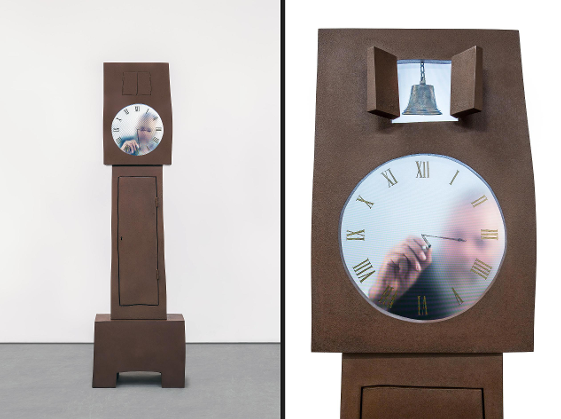 Baas is a Dutch furniture designer who created his Grandfather clock by filming actors through a hazy pane of glass as they carefully draw and wipe away the numbers in real time. 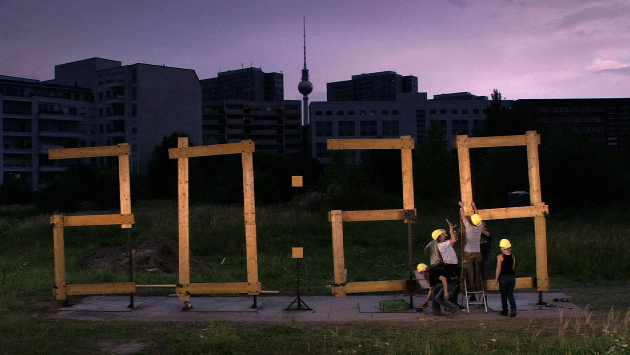 German Formanek commissions 70 workers (in three shifts) to continuously build a digital time display in real time: a work that involves 1,611 changes within a 24 hour period. English artist Darren Almond explores the effect of time on individuals. 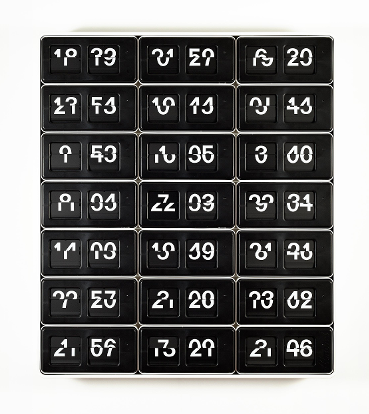 His assemblage of flip dials, with numbers cut in half that change every minute, produces a clock incapable of telling the right time. The irony of the title will not be missed. 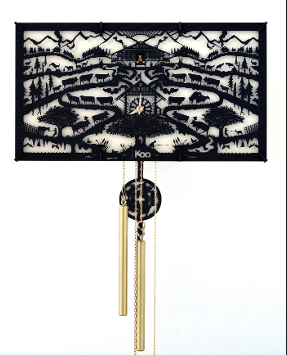 Two former students of Lausanne University of Art and Design (ECAL), d’Esposito and Gaillard are behind the Swiss Koo cuckoo-clock manufacturer. They have revived this forgotten genre in a style that blends kitsch with an eye for design. “Poya” is when cows leave their stables and return to the mountain pastures for the summer months. This clock is also a nod at the Swiss tradition of découpage: silhouettes cut from paper which also served to record the number of cows a person owned. As the paper roll unwinds, time is printed out minute by minute, until the hour when a cuckoo ‘sings’ on the paper. Sponsored by the Fondation de la Haute Horlogerie (FHH), the exhibition brings together more than 150 objects from all over Europe. The historic pieces are from private and major public collections, in particular those of the Musée International d’Horlogerie (MIH) in La Chaux-de-Fonds, Musée de l’Horlogerie Beyer in Zurich, Musée d’Horlogerie du Locle – Château des Monts in Le Locle, Musée des Arts Décoratifs in Paris, and the Louvre in Paris, as well as from the heritage collections of leading manufacturers including Vacheron Constantin, IWC and Jaeger-LeCoultre. Scenography is in collaboration with Lausanne University of Art and Design (ECAL), led by Alexis Georgacopoulos and industrial designer Adrien Rovero.